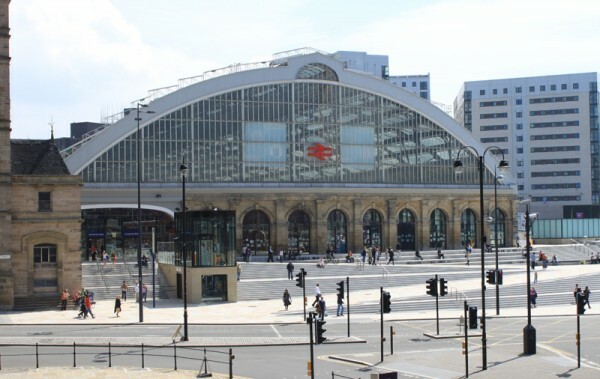 The concrete mess on the front of Lime Street Station was one of the worst eyesores in the city. It was a badly executed, dreary, unimaginative waste of concrete that hadn’t aged well. Worse it was right in the heart of the city centre, covering up the face of one of the country’s great Victorian railway stations that is still a major gateway for visitors arriving in Liverpool. So when they finally started to pull it down I was really looking forward to seeing the new front. I was however a little nervous. The rebuilt slab square in my home town of Nottingham just makes me want to cry. It has been turned into a bland, featureless slab with an embarrassing water feature that almost seems to have the ambition of escaping from an episode of Ground Force. I’m sure it’s very good for events but as a public space the rest of the time I’d take the old, fussy square back and do up the disgusting public toilets. The new Lime Street frontage didn’t have a bold feature like the new frontage to Sheffield Station with the magnificent with the water covered blade slicing across it. Could this be just another dull square that would reveal the station but nothing more? Well I’m pleased to say that its far more than just a dull piazza. The front has curvaceous steps intercut by ramps that sweep across its front. Some of the paving on the ramps have images cut into them and more images have been included in the new glass in the arches at the front of the station. There are places to sit and watch the world go by and an area with trees that breaks up the slabbed space. Even though its only been open a few days it was obvious that it has already become a place to have your lunch or to meet people in the city centre. There is a stubby tower including a lift that allows access from the station to the street and down to the underground station. Which could hardly have been made smaller and which provides a visual clue to where the doorway in is for the unfamiliar traveller. The new front doesn’t just reveal the lost front of the station. It opens up the view across Lime Street that I’ve never seen before. 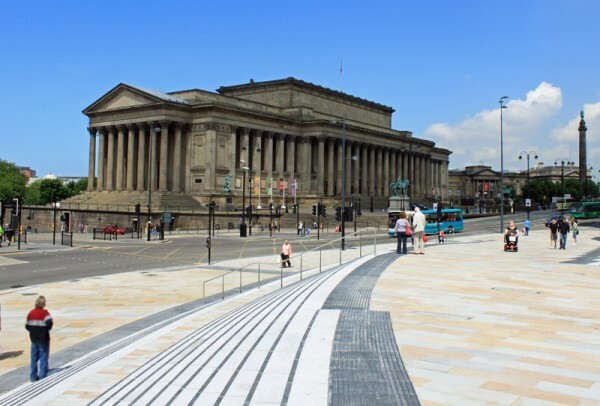 The sweep of the front of St. George’s Hall is opened up to the eye. The one major piece of work left to do in the area is someone to restore the art deco cinema. Unless someone wants a big project and decided to do away with the St. John’s shopping complex but that might be a bit extreme and where would all the shops go?